Brown sampled Indaba Coffee's flat white while here in 2015. Too bad he just missed Inlander Restaurant Week. 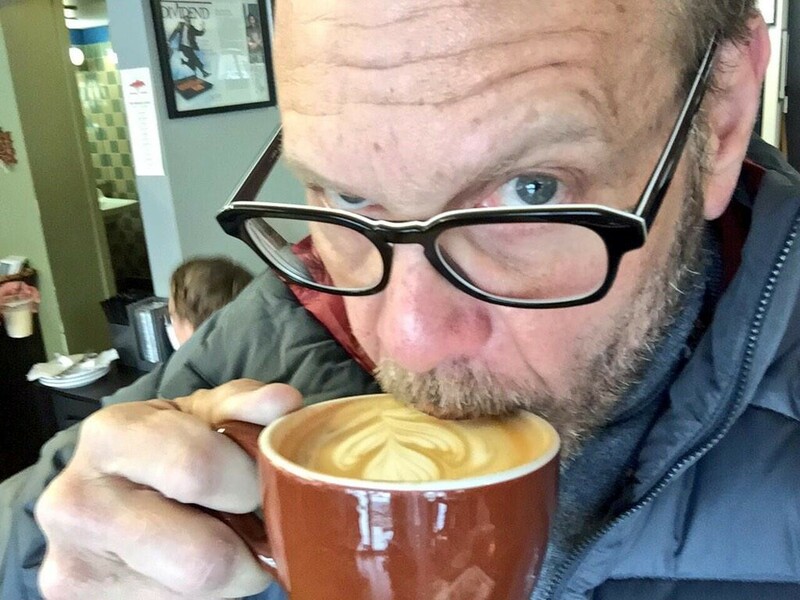 Still, charismatic food guy Alton Brown is planning to dine his way around the Lilac City when he comes to town later this month for his live stage show, "Eat Your Science." But first, he's looking to all of us for recommendations. Today on his Facebook page, Brown invited fans to share their top spots they think he should check out while here for the March 29 show at the INB Performing Arts Center. By leaving a comment or using the hashtag #ABRoadEatsSpokane, fans can share their recommendations on social media. Then, be on the lookout for the bespectacled Brown (follow him on Instagram for updates, too) at local restaurants and coffee shops in late March. When Brown was last in Spokane for his "Edible Inevitable" show in spring of 2015, he later lauded the coffee he tried at both Coeur Coffeehouse and Indaba Coffee, the waffles at The Scoop and tasty sandwiches at Stella's Café. He capped off the day with dinner at the Wandering Table in Kendall Yards. Any of our city's James Beard-nominated chefs' restaurants: The Wandering Table and The Gilded Unicorn (even though he dined at WT last visit, the Gilded Unicorn debuted since), both owned by 2016-nominee Adam Hegsted; 2015 nominee Jeremy Hansen's Santé, Common Crumb Artisan Bakery or his latest two projects, Inland Pacific Kitchen and Hogwash Whiskey Den; as well as this year's nominee, Laurent Zirotti of Fleur de Sel in Post Falls. If he has a hankering for Chef Tony Brown's food, he'll find the celebrated sandwich line-up of the former Stella's now at Ruins, along with cocktails and a regularly rotating dinner menu. Finally, if he'd like to try some eateries that have debuted since his 2015 visit, there's lots to choose from, including The Blackbird, 1898 Public House, and Table 13 inside the new Davenport Grand Hotel. Of course, there are plenty of longtime, tried-and-true places that we all know and love, so make sure to share your top picks!